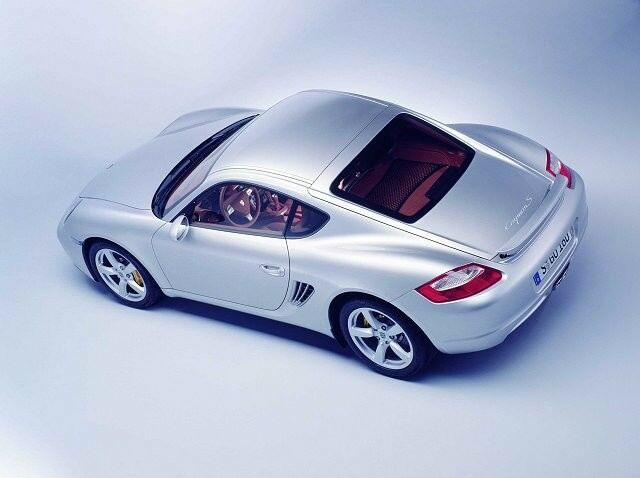 It took a while for Porsche to build a coupé version of the Boxster, finally doing so in 2005. It took a while for Porsche to build a coupé version of the Boxster, finally doing so in 2005. Proving worth the wait the Cayman (and the bigger-engined Cayman S) went on to gain accolades worldwide. Punching well above its weight it has remained the benchmark sports car in its class while keeping those in the group above fairly honest too, yet in many (misguided) people’s eyes it will always be a poor relation to the 911. Don’t believe it; the Cayman is about as involving and enjoyable a sports car as your money can buy. As with the Boxster, which is the Cayman’s open twin, Porsche’s coupé is offered in two guises - the standard Cayman and the S. For the early cars that means a 2.7-litre flat six-cylinder engine in the Cayman, and a 3.4-litre unit in the Cayman S. That swelled to 2.9 litres in the standard Cayman from Porsche’s 2009 model year facelift, the S’s 3.4-litre capacity remaining unchanged - though revisions to the head saw the power boosted by 25hp. Even the most modestly powered 2.7-litre delivers 245hp (the early S has 295hp), which is around 10hp more than its Boxster relations. The differences don’t stop there, the obvious addition of the roof adding to the car’s stiffness, imbuing it with even greater precision on the road over its roadster relation. The styling changes are slight over the Boxster: the front grilles under the headlamps feature round driving lights, while the front gains a splitter that’s usually painted in a contrast brushed silver finish. Badges aside the Cayman S and Cayman are distinguished externally by their tailpipes, the S gaining two pipes over the large single one in the 2.7-litre (and latterly 2.9) cars. S models also came with larger alloy wheels as standard, as well as enhanced equipment levels. Choice options are Porsche’s communication and satnav system - dubbed PCM - as well as sports seats, leather interior and iPod connectivity. A few specials were offered, the Cayman R being the ultimate edition, it stripping weight for more purity and immediacy, to tremendous effect. They’re rare and expensive though. There’s an automatic gearbox choice too, initially a Tiptronic transmission with a torque convertor, though facelifted cars come with Porsche’s PDK dual clutch system. If you must go for an auto the PDK is the better option. Nothing beats the slick six-speed manual as a real driver’s car though. The Cayman - standard or S - is thrilling and involving like little else, yet remains entirely civilised as a day-to-day proposition at the same time. None are bad, so it’s down to budget and availability. The 2.7-litre cars are the easiest t0 find in Ireland, though if you’ve the time and means then it’s worth seeking out a 3.4 S, purely as it adds even more performance into the equation. If it’s a post-2009 car with more power then all the better, but realistically pre-2009 makes more sense. An astonishingly capable, talented and enjoyable sports car. Why it remains in the shadow of the 911 has long been a mystery, as it steers with greater purity, rides beautifully and is more than quick enough for the road. If you can afford it, then you should. No question.